One of the more underrated forwards in the Metro Detroit area, Dorian Armstrong, has decided to continue his basketball career at Siena Heights University next season. Armstrong, a 6’6″ power forward/ center has been an automatic double-double for Mt. Clemens this season, averaging close to 10 points and 12 rebounds a game so far for the Bathers. One of the reasons why Dorian chose Siena Heights over schools like Wayne State and Aquinas was because Siena Heights made Dorian a top priority on their recruiting list. He will be given the opportunity to play immediately in college, a key for his decision. “I feel my game can transfer very well at the college level.” Dorian noted. “Because I have a high-motor and my coach taught me to go to the action so I think that can get me very far at the college level. Dorian and his fellow Bathers are amongst the top in Michigan’s Class C, and are gearing up for what they hope to be a long and successful playoff run. 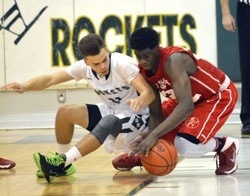 The Rockets of Westland John Glenn started the 2013-2014 basketball season a lethargic 2-3 in the non-conference portion of their schedule, but gained momentum after senior Isaac Everett returned to the lineup after starting the campaign with a broken thumb. Glenn eventually righted the ship to go 9-1 in league play and win KLAA Kensington South Division, their third in a row, and now their first Kensington Conference title for head coach Dan Young who will be stepping down at the conclusion of the season. Senior Isaac Everette, a member of last year’s Glenn team which saw their hopes of winning the Kensington Conference fall one point short to rival Canton, came out and started the first quarter and scored nine of his game high 26 points, which helped the Rockets gain a 21-10 advantage over Salem. After only scoring seven points in the second quarter of play, Glenn started the third on a 10-4 run to lead 44-33 heading into the fourth with 6’7″ senior James Pruitt on the court who fell victim to foul trouble in the first half. Salem would not go away easy on their home court, led by senior Connor Cole, the Rocks would cut into the Rockets lead beginning the fourth on a 9-3 run, with Cole scoring 10 of his team-high 16 points in the final frame. The Rocks would eventually only trail by four points with 1:25 left remaining. The man Salem wished to send to the foul line in an attempt to prolong the game was the senior Everette. Isaac went only 3-7 through the duration of the game, however, Everette hit six straight crucial free-throws to seal the second championship Glenn has won this season. James Pruitt chipped in the Rockets victory with double-double, 10 points and 16 rebounds, junior Mychael Bradley had seven points in the win as well. Glenn will now host the KLAA’s Lakes Conference winner, Lakeland, Thursday night at John Glenn for the KLAA Association title. One of the hardest tasks in sports is to defend a championship, especially when the opponent is your bitter division rival who beat you earlier in the year. However, Pershing was able to outlast Southeastern in overtime to claim their second straight DPS City Championship by the score 57-56. As soon as the game started, it looked as if it would be Southeastern winning their second city title within the last four years, jumping out to a 21-9 after the first quarter, and then eventually 29-19 at the halftime. In the second half, Pershing started to get their offense going. Buffalo Bulls commit Mory Diane highlighted the comeback scoring 13 of his game high 15 points in the second half, including the game tying floater in the lane for Pershing with 33.2 seconds left that capped off a 15-2 run for the Doughboys to send the game in to overtime. Pershing never trailed in the overtime, even with seniors Justin Tillman and Diane fouling out within the first two minutes of the period. Pershing eventually led by one point with 6.2 second left, after two missed free-throws by Kam Barden, Southeastern did not get the ball passed half court, giving Pershing the hardware. Mory Diane led all scorers with 15 points, Kam Barden chipped in with 13 points, and Darsean Woodson had 10 points for Pershing. Southeastern was led by Leonard Harper-Baker with 15 points, and D’Cari Charleston scored 12 points for the Jungaleers. Both teams now move onto the state tournament which begins in about a week. For Pershing, who always have state titles on their mind, a game like this can serve as a teaching point for how to start a game. So much has happened since the last team rankings were released. But yet again, teams are gaining momentum at the right time of the year with the first playoff game less than two weeks away. As conference championships are being determined, it will be difficult for teams to keep their eyes on state titles. 10. Waterford Our Lady of the Lakes. Many view Orchard Lake St. Mary’s as a football power within the State of Michigan. However, the Eaglets have quite a winning tradition on the hardwood, with six Catholic League titles since the 1998-1999 season under dual football and basketball coach George Porritt, while producing notable players such as former Michigan State point guard Kalin Lucas. The 2013-2014 St. Mary’s squad has had an up and down season thus far, but have the potential to make a long post-season run in the Class A state playoffs, and a key player in determining if St. Mary’s has a successful campaign will be junior 6’4′ shooting guard Ted McCree. A versatile scorer and finisher on the offensive side of the floor who models his game after Kevin Durant, McCree in the midst of a break-out junior campaign. Averaging about 23 points a game this season (for a club that scores 52 points a game), including a phenomenal 32 points against Brother Rice earlier in the year, and hauling down eight rebounds each game as well. 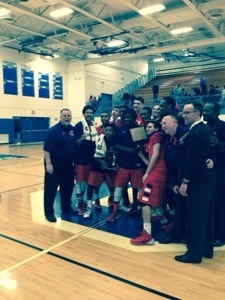 The Class of 2015 in Michigan is full of guards and wings that have the ability to put the ball in the basket. He says scoring the ball is his natural talent, but in order to distinguish himself from his competitors, Ted is aware that he must bring a variety of skills to the court in order to achieve success. McCree does have an official college offer as of now, however, the St. Mary’s junior does have a list of schools that keep in contact with him regularly such as U of D Mercy, Akron, Florida International, Central Michigan, and Oakland. While he is far from making a college decision, Ted does have a few qualities he will look for in a school that will be crucial when makes his college decision. Basketball does not end simply at the conclusion of the high school season for players anymore. The first AAU tournaments of the season are only a few weeks after the high school season closes. And while there is still much to play for in a St. Mary’s uniform, McCree is eager to reunite with his AAU program from last season, Detroit’s own The Family. Ted is hopeful the upcoming AAU season will help boost his recruiting situation, but at the same time, is looking forward to playing with fellow notable juniors in the state. “I will be looking forward to the Peach Jam Tournament,” Ted had to say, “because I missed that tourney last year.” “I played with them (The Family) in Indiana, and I had fun playing with guys like Eric Davis and Bakari Evelyn. Behind strong performances from seniors Kenny Goins and Stef Johnson, as well as junior Derek Murphy, the Warren Mott Marauders were able to run past Grosse Pointe North 88-72 to improve their record to 10-5 overall, with a 7-2 record in the MAC White division. With regular starters wing Derek Murphy and power forward/center Kenny Goins not starting for Mott, senior combo guard Stef Johnson came out hot for the Marauders, scoring 10 points in the opening 8 minutes of the game to give Mott a 31-20 advantage after one. Once Mott returned to full strength in the second quarter, with Murphy slashing to the basket, and Kenny Goins dominating the paint, running the floor, and controlling the boards, the Marauders built up their largest lead of the game at 49-28 with one half of the game left. North came out strong in the third quarter trailing only by 13 with 4:31 left in the period with senior forward Justin Kennedy doing all he could to match Goins down low on the block. Kennedy had his moments throughout the game, he has a nice back to the basket style of play, and can score on either side of the basket. However, Mott opened the floodgates in the fourth, and took the starters out with 4:34 remaining in the contest and coasted for the easy victory. Goins finished with a double-double for Mott with 27 points and 18 rebounds, Derek Murphy had 24 points, and Stef Johnson contributed with 15 points of his own. Kennedy finished with 23 points and 10 rebounds for North. Behind a tremendous performance from senior Tony Jackson, the Spartans of Warren Fitzgerald clawed and scratched their way pass Grosse Pointe South to place their record at 11-1 overall, and a two game lead in the MAC Blue Division at 8-0 over South with a record of 6-2. Fitzgerald got off to a quick start in the contest, with senior DeAngelo Hutson hitting two threes in the opening minutes of the contest to give Fitzgerald a 17-9 lead after one. Fitzgerald continued to play hard-nosed defense, keeping South on the perimeter for the majority of the second quarter, and were eventually able to stretch their lead to 11 at 30-19 at half, setting up one exciting of a second half in high school basketball. After being held to only 6 points in the first half, Grosse Pointe South senior big man and McDonalds All American nominee Danny Dixon began to assert his will in the opening minutes of the third. Dixon was unstoppable for South in the third, he was connecting with everything within 5 feet of the basket, using his superior size at 6’8″ to his advantage over the much shorter Spartans to score 14 points in the third to put South back in the game at 41-38 entering the fourth. Grosse Pointe continued to feed Dixon in the opening minutes of the fourth, a 5-0 run by Danny himself gave South their first lead of the contest since the opening minutes of the game at 43-41 early in the fourth quarter. With Dixon dominating inside, it allowed senior guard Jabari Burton to attack the basket and get to the free-throw line to give South their largest lead at 51-43 with 4:59 remaining in the contest. However, the Spartans did not want to send their fans home unhappy on senior day, a 9-1 run over the next 1:52 minutes was capped off with a Tony Jackson and-one on a three pointer to knot the game up at 52 all. South would never retain the lead the rest of the game, senior Aron Black’s only basket of the game would be the game decider, a lay-in with 2:07 left in the contest would give Fitzgerald a lead they would never give up the rest of the game. A Hutson three pointer would give Fitzgerald a 58-54 lead with 1:10 in the contest, and finally Tony Jackson and DeAngelo were able to go 3-4 from the charity to put the game away sealing the win for Fitzgerald. Tony Jackson was the definition of a stat sheet stuffer for the Spartans all game long, Jackson finished with 30 points, six rebounds, four steals, four blocks, and three assists in the win for Fitzgerald. Jackson played fearless the entire game, driving to the rim on every play, slamming a few home on the break, and has a bruised eye to show for his performance, Tony knew he had to step up his play when fellow senior and starter Jeremiah Becker went down with an injury in the first half. Tony is listed at 6’3″, and Fitzgerald’s tallest player on the roster, while it maybe a disadvantage going against the taller Dixon of South, the Spartans were able to use their speed and quickness in order to get the win. Jackson’s partner in crime for the game was 5’10” guard DeAngelo Hutson, who contributed with 20 points on the night, and while Jackson was banging down low it the post, it was Hutson who kept South off-balanced with five three-pointers in the contest. Fitzgerald will have no more home games the rest of the year, and will have to go on the road in order to gain momentum for the playoffs. Grosse Pointe South was led by Danny Dixon with 31 points, and 14 rebounds. After holding a narrow 28-25 lead at halftime in a tightly contested rivalry game, the Wildcats of Allen Academy were able to hold off River Rouge in the second half of play to up their record to 14-1 on the season and a perfect 5-0 in the Michigan Metro Conference. “It’s always good to win a game like that, especially when the other opponent is talking trash,” said Allen Academy senior guard Pakiya Ellis. Ellis and sophomore guard Jason Williams both scored 27 points on the night, with Williams dropping seven assists, and Pakiya hauling down eight rebounds and swiping five steals. Craving an upset, Rouge came out hot to start the game, leading 15-14 after one, in a first quarter which saw Ellis score 11 points and three three-pointers in the opening. After a sluggish second quarter for both teams, it was the sophomore Williams taking the game over in the third. The 5’9″ Williams scored 15+ of his 27 points in the third to give Allen 47-36 lead after three, with his jump-shot not falling the way it normally does, Williams knew he had to attack the basket, get to the free-throw line, and set up his teammates in order to be successful on the night. Allen was able to keep Rouge and bay in the fourth, not letting the Panthers get the lead into single digits the entire period. In a Class C with the likes of Detroit Consortium and Mt. Clemens at the top, the Wildcats are right where they want to be, under the radar, picking up momentum and improving everyday for district play which starts in less than a month. 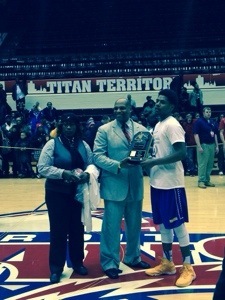 Jalen Gibson led River Rouge with 21 points and 18 rebounds. In the Battle of Hannan Road between the Romulus Eagles and Belleville Tigers, it was the Eagles of Romulus coming out victorious with a 56-36 decision. It was clear this rivalry game would be a slugfest, with the first basket of the game not coming until 4:30 in the first quarter, Belleville eventually led 10-7 after the opening frame. After leading 25-19 at halftime, Romulus came out and started the third quarter on a 6-2 run to lead 31-21 with 5:36 remaining, a double-digit lead the Eagles would not give back for the rest of the game, holding Belleville to only 7 points in the fourth quarter. This is a huge win for the Romulus Eagles, with starting guard Tyron Hamby and junior Rio Washington out for the game, the Eagles knew others would have fill the void left by Hamby and Washington. Sophomore D’Angelo Hansbro played arguable the best game of his young varsity career, the 6’0″ point guard started the game, and helped out with a 14 point and six rebound performance. A consistent starter so far this season for Romulus, Bell scored all eight of his points in the first half, with 5 coming in the first quarter that helped Romulus gain confidence on the offensive-side of the floor after a shaky start to the game. Along with Hansbro and Bell, junior guard Jaylin Walker contributed in the win with 15 points and ten rebounds, most of which come in the third quarter and were vital for Romulus in taking control in the game, and senior wing Kris Clyburn scored 12 points, hauled down nine rebounds, and played defense coming away with five steals. Arlington Hambright led Belleville with a team high 13 points. The last month of the regular season of high school basketball is upon us. During this month, teams will attempt to gain momentum before the playoffs that start in roughly a month. A truly competitive season will only be getting better as the season winds to a close.